Realme U1 - Full phone specifications: Realme Smartphone brand has launched another new phone with the name "Realme U1" in November 2018. This phone consists of high-end specifications. The screen size is 6.30 inch with a resolution of 1080 pixels by 2340 pixels at a PPI of 409 pixels per inch. The price in Indian market is Rs 11,999-/-. The phone has a MediaTek Helio P70 processor which works smarter & faster. It has powered by 2.1GHz octa-core processor and it comes with 4GB of RAM. Realme U1 packs with 64 GB Internal memory and external memory expandable up to 256 GB. The camera is perfect for the selfies because it has a 13-megapixel primary camera and 25 Megapixel secondary camera. The Realme U1 phone runs with android Orea 8.1 and it in builds with 3500 Mah non-removable battery. 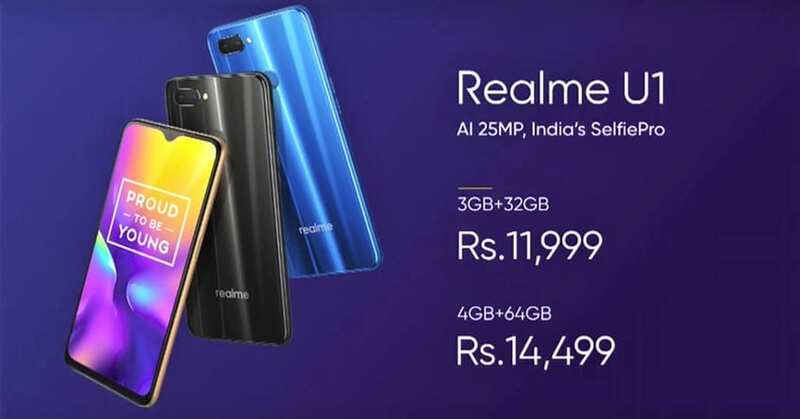 RealMe U1 available in 3 different variant colours (Fiery Gold, Ambitious Black, Brave Blue). Realme U1 Phone is Dual-SIM (GSM and GSM) smartphone that compatible with Dual Nano-SIM + MicroSD card Dedicated Slot. Realme U1 Smartphone Connectivity selection includes Wi-Fi, Bluetooth, GPS, Audio Jack, sim slot(Dual Nano-SIM + MicroSD card Dedicated Slot).